This is Jami's version of risotto... it is EASY because I don't enjoy hard. Saute mushrooms in butter and EVOO; season them with salt, pepper and garlic powder. Add water, chicken bouillon, water and rice. Bring to a boil. Boil until all liquid is absorbed, stirring constantly to avoid rice sticking to the pan. When all of the liquid is almost absorbed, sprinkle cheese into rice and mix it in. Serve garnished with more Parmesan. 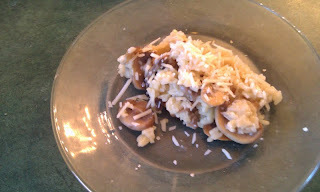 Thanks for submitting your recipe for Mushroom Risotto to Food Blog: Post of the Day.